I had to run into Target over the weekend to pick up a birthday gift for one of Grant’s little buddys. I figured since I was there, I should grab a few gallons of milk too. As I cruised down one of the aisles, I noticed that some of the granola bars were on sale AND you got a Target gift card if you bought five boxes. While I stood there looking at the display and choosing which flavors I wanted, a woman came up to me and began to inspect the contents of my cart. Lady peered into my cart as if she would be quizzed on the contents later on. Lady looked from my cart to the display and back again. 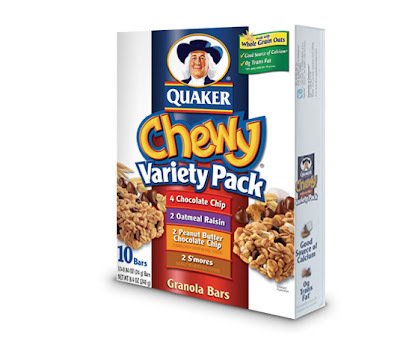 “Are these good?” she asked, indicating the box of Quaker Chewy Granola Bars in my cart. I explained to her that they are a bit on the sweet-side for me, but I was buying them for school lunches and my boys like them quite a bit. I let her know that my personal favorite were the Fiber One bars with anti-oxidents. Lady proceeds to ask my opinion about every other brand and variety of granola or cereal bar on the shelf, including Pop-Tarts. I give her my opinions. 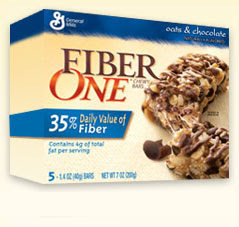 I suggest flavors and brands that are good, but when she repeatedly asks me for one that I like I repeatedly answer that I like the Fiber One bars. Lady wonders if her son will get peanuts or other snacks on the plane. I joke about checked luggage needing to buy its own ticket these days and the cutbacks in on-board service. “I don’t want him to be hungry.” she says. Now this is dangerous territory. Fortunately, she answers her own question. Her son is 43. She switches back to her concerns about the Fiber One bars and the lightning fast poo poo she thinks they will produce. “I just don’t want those kicking in on the plane.” I ask her how long his flight is. She tells me that it’s about 7 hours. I open my mouth to respond. I’m sure I look like a fish out of water, gasping and flopping on the dock. I just have no response for this. Wow, just wow. Your story is the perfect definition of “no good deed goes unpunished.” You try to help and end up almost going crazy in the process. So, did she buy any snacks for her son? OMG, I wish I could have seen this scene play out in person. Too funny. Glad to know I’m not the only one who goes to Target looking less than fashionable. I actually dread days that I actually HAVE to do my hair in some way OTHER than a ponytail. I can see this playing out perfectly. Oh.my.word. Sometimes you just gotta paste that smile on and nod. OH.MY! I’m a trying hard these days not to be critical of people and not to judge but this story took me there. Did she have on a white jacket? What a dork. The lady, I mean. A cotton head dweeb. Wonder if the poo poo boy lives at home? No way! That is too much!!! I would have just died and then tried to leave that aisle A.S.A.P. Hilarious. I probably would have literally smacked my forehead when she said the return flight was shorter. Wow, are you patient! Maybe he won’t need snacks on the short flight back. You must have looked like the resident granola bar expert. I’m dying over here right now. Best story ever. another reason to not interact with the public if at all possible! yeesh! I am guessing her son is still single and lives in her basement! This is why I do not make eye contact with strangers! To quote my friend Debi she’s layers of dumb and stuck on stupid! You have more patience than I my friend! Oh my gosh! HOW did you not try to slap some sense into her?? Excuse me, sweetie…couldja tell me; WHICH BARS HAVE GINKO BILOBA???? LOL. Can you imagine being her son??? (well daughter would be more appropriate). Now, about those bars…how quickly do they act…? So you’ve met my Aunt Jennie, then? Oh my H! You’re saving all this material for your book, right? Welcome to my world at work. Oh yes. On a daily basis. My bill was $5 and I paid it why am I getting a bill? Well sir you paid $5 but have used it again and now you owe $5 more. No, I paid $5 so I owe nothing. No sir you have two charges of $5 on your account and you only paid once. Yes sir, you paid for one but not the second one. And this goes on all day long in various forms. Oh and once the interest kicks in on the bill and they call about that you wish you could eat the whole box of Fiber One bars and spend the rest of your life sitting on the crapper. Well I feel better, thanks. Did I mention how funny you are? 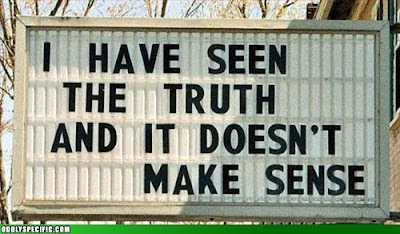 ohhhh, my cheeks hurt from laughing…classic one!